9 x 10 x 10 1/4 in. 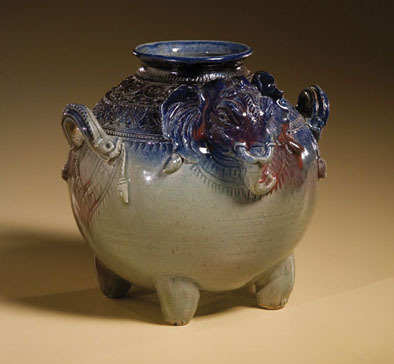 This pot features an elephant, a creature that Cambodians value both for transportation and for spiritual reasons. During droughts, farmers pray to the elephant for rain. It's maker, Yary Livan, is one of three survivors of his generation of artists trained in traditional Khmer ceramics at the Royal Academy of Fine Arts in Phnom Penh, Cambodia. The rest were persecuted and killed by the Khmer Rouge in the late 1970s. Yary survived by using his knowledge of ceramics to build wood-burning kilns needed to manufacture clay roof tiles. Emigrating to Lowell, Massachusetts in 2001 Yari set up a studio with support from a leader in the local Cambodian community. In no time, he began producing a surprising amount of work. In 2015, Yary Livan was awarded a National Heritage Fellowship.